I was studying nuclear reactors at a university in Moscow when I realized that I wasn’t passionate about my work. I decided to move to another city in Russia, Kursk, where I’m now pursuing a new course of study. In Kursk, I studied information security. I quickly realized that my classes were more theoretical than practical and that I needed to supplement my studies if I was ever going to be able to find a job. To my surprise, I observed that IT enthusiasts without an academic background had deeper knowledge about the field than I did. To fill my knowledge gaps, I came to Coursera. 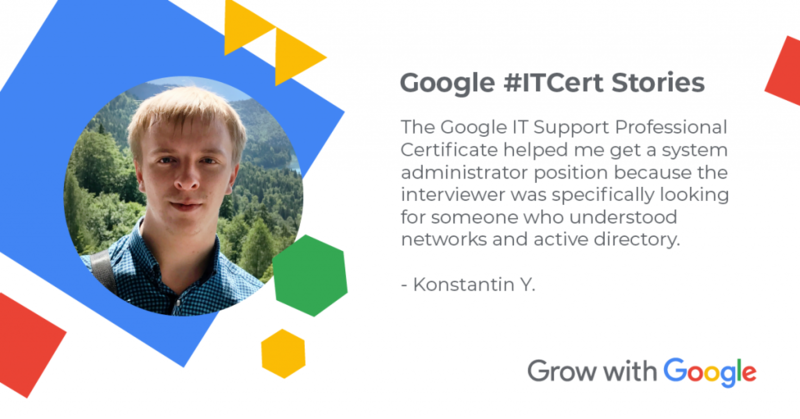 The skills I gained through the Google IT Support Professional Certificate program have proved invaluable. They helped me succeed at my interviews and secure a job before I even graduated. Today, I’m armed with both a degree in IT and a Professional Certificate from Google. Recently, I found out that my company, which operates multiple supermarkets, was looking to hire an Information Security Administrator. My coursework helped my build strong skills in networking and Active Directory, so I decided to apply for the position. After I interviewed, they offered me a role as a System Administrator. I accepted the offer, and I’m really loving the work so far! I would like to thank everyone at Google and Coursera who were involved in creating this program. You helped me change my life!